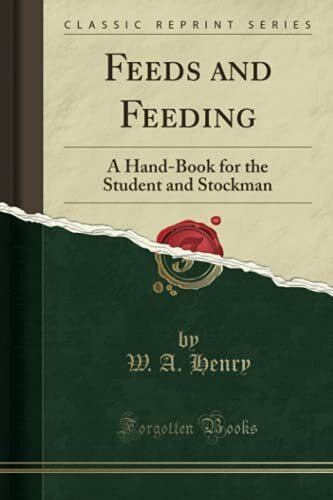 Excerpt from Feeds and Feeding: A Hand-Book for the Student and Stockman<br /><br />During the past few years exceedingly important discoveries have been made concerning the science and practice of live stock feeding. Further more, economic conditions have radically changed. Therefore, Professor Morrison has again entirely rewritten the book to include the latest information and to adapt it to the changed economic conditions since the World War. Just as in the previous revision, the results of many important investigations, completed so recently as not yet to be in print, have been furnished by scientists thruout the country, in order that the findings might be presented in this revision.<br /><br />About the Publisher<br /><br />Forgotten Books publishes hundreds of thousands of rare and classic books. Find more at www.forgottenbooks.com<br /><br />This book is a reproduction of an important historical work. Forgotten Books uses state-of-the-art technology to digitally reconstruct the work, preserving the original format whilst repairing imperfections present in the aged copy. In rare cases, an imperfection in the original, such as a blemish or missing page, may be replicated in our edition. We do, however, repair the vast majority of imperfections successfully; any imperfections that remain are intentionally left to preserve the state of such historical works.